We are the Azure Lorica Foundation, in need of your support. 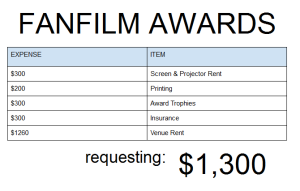 For the first time, we are creating the FanFilm Awards festival and ceremony. It is our intent to have screenplays read and films screened, allowing industry professionals to aid independent artists in one cultural event. With your contribution, we’ll be able to give a proper presentation, with trophies and catering, a venue to host the event, and guest celebrities to support independent films. We’re doing our best to fund it from our own pockets, but we’re lacking time to gain proper funding for the production ourselves. Please help, and support a worthy cause for the art of film making. We need $5000, but all we’re asking from you is $1,300. Below are the operations expense cost. We’ve already handled Photographers, Staff, and Guests of Honor. We are still managing our own jobs to fund the project, but lack the time to reach our goal. We hope that you can be the boost in our campaign. The FanFilm Awards is a chance for independent film makers to make their dreams come true. It supports their work as artists, as fans of the entertainment industry, and showcase their talent before the professionals they’ve labored their entire careers to join. As a nonprofit arts organization, we function mainly through donations and volunteers. We produce festivals carefully in the company, donating what we can in order to provide a service in the arts. Lately, though, we’re supporting a community in need that we did not anticipate to help. Film makers are a community themselves. Building an Anime Convention was quite the investment, rendering funds beyond that production inaccessible for new projects. So with this new service for this community, we need real help. We’re paying for the insurance, trophies, screen and projector, and much of the necessities to host the event, but in order for us to present our film makers to the agents and sponsors, we need to impress them – inviting special guests and venue rental is not cheap. We’re asking you to help with the basic screening room, not the panel room, not the green room, not even the garden, or security. Just the screening room. We wish we could take over the whole Cultural Center, but we only need the basics. It is our first year, and we do not want to be too lavish to complete this challenge. This entry was posted in 2015, Newsletter and tagged awards, azure lorica, azure lorica foundation, blog, eugene cordell, fanfilm, fanfilm awards, film, google, jaccc, japanese cultural and community center, movie, newlsetter, watch. Bookmark the permalink. We are growing day by day, and we want you to be part of this magnificent festival! We have the film makers, screenwriters, and actors joining us in this event – all that’s missing is you.